Our snowy campus this week! quite here yet. While most students and teachers on Spring Break would have enjoyed such a morning from home on the couch, sipping a warm cup of coffee and watching the snowy trees sway in the wind, ten high school teenagers and four members of their school staff chose to work through the cold and support the work of Joy Ranch! 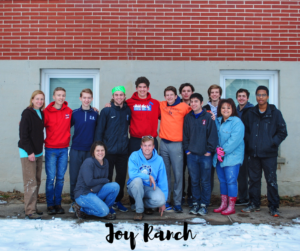 The Joy Ranch team is so thankful for the incredible work done this week by a wonderful group of volunteers from St. Louis University High School, also known as SLUH! This is the seventh year that St. Louis University High has volunteered to work on the Joy Ranch campus. This year, the SLUH group consisted of 10 energetic and hardworking high school boys, as well as their fearless leaders: Ms. Meg Beugg, Mrs. Lori Figge, Mr. Dominic LaMantia, and Mrs. Amy Mersinger. 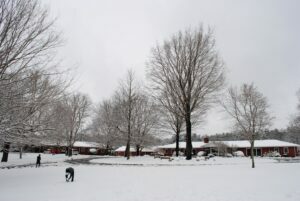 Even though the campus was filled with a few inches of freshly fallen snow, they worked tirelessly on various projects. From putting in new fencing along our property, painting and flooring our Girls’ Cottage’s laundry room, to shoveling the campus roads and renovating a cottage basement, this group had an incredible work ethic! After a long day of hard work, the group still put aside time to get to know the Joy Ranch family. They ate dinner with the cottages, played basketball with our guys, and even had a kickball game with some of our kiddos! Joy Ranch is endlessly grateful for all of the hard work from SLUH over this past week, and so thankful for the kind, positive, and encouraging attitudes exuded by every member. Joy Ranch could not operate without the love, support, and hard work from our incredible volunteers!!! Thank you, SLUH!! We hope to see you next year!! What a good looking group! Thank you, SLUH! Can’t wait to see y’all on a July 26th. I know your daddy can’t wait either. I’ll be going with mom and dad(Larry and Gail Jackson)!! See you soon Hannah and Gabe!! Joy Ranch here come Ephesus Baptist Church Volunteers!!! !